Patio heaters allow you to extend the time you can enjoy outdoors to colder days of the year. This simply means that if you live in regions that do not have very harsh winters, you could use your patio year round, and even if you live in a northern state where winters are much harsher, you could extend the use of your patio from a few extra weeks to a couple of extra months. 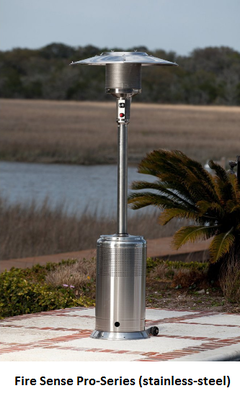 The most popular patio heaters are those standing tall (around 7 to 8 feet) and fueled by propane like the one shown in the picture. The propane tank stands inside the base of the unit, and there is a hood that serves as reflector on its top. The base is usually weighted (with either sand or water) to enhance the unit’s stability under windy conditions. Propane heaters are very convenient as they require no installation like in the case of natural gas, and they offer mobility. In addition, these patio heaters usually have ​an attractive design that integrates beautifully with you patio, enhancing its look. ​ A nice alternative to a fire pit, the gas patio heater delivers quiet, soothing, consistent heat, with no smoke or open flames to worry about. 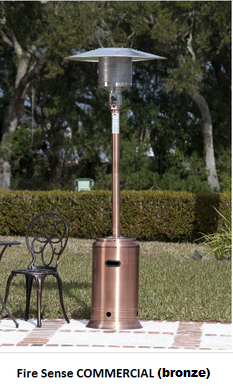 The most popular propane patio heater brand bought by Amazon customer is Fire Sense, and more specifically the Fire Sense Commercial model which comes in many colors and finishes. Not only was this heater the #1 top seller in its category at the time of this writing, but it had received an average rating of 4.5 stars (out of 5 stars) from Amazon customers. In this article, we will compare the most popular and best rated Fire Sense patio heaters bought by Amazon customers so you can make the right choice for your needs. More specifically, we will compare Fire Sense Commercial with Fire Sense Pro-Series. At the time of this writing, both had received an average rating of 4.5 stars (out of 5 stars) from Amazon customers. 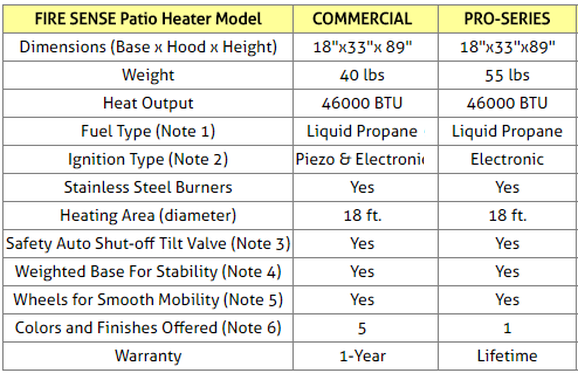 The Fire Sense patio heaters to be compared are shown in the pictures below. Note that the Fire Sense COMMERCIAL model is offered in various colors (though only certain colors are shown in the pictures below, in the Amazon products section further down in this article, you will be able to access and see all the various colors and finishes that are offered). Note 1: Both models considered here require a standard 20-pound Liquid Propane gas cylinder (not included). The consumption rate is, approximately, 10 hours using a full 20lb tank. Note 2: With both the Piezo and Electronic ignition systems, all it takes to light the heater is a simple push of the button. A large variable-heat control knob allows for low or high heat settings and for turning the heater completely off at the end of the night. Note that the Electronic ignition system requires an-AAA battery. Note that for the Fire Sense COMMERCIAL model, except for the one that comes in stainless steel, they all have the Piezo ignition system. The stainless steel one is equipped with the Electronic ignition system. Note 3: For enhanced safety and peace of mind, both patio heaters considered here feature an automatic shut-off tilt-valve that turns the heater off automatically if it gets tipped over. Note 4: Both models are preassembled with a sand/water box at their bottom that can be filled with water or sand for increased stability under windy conditions. Both models considered here come with an included wheel assembly which make these patio heaters is easy to maneuver. The heavy-duty wheels are designed to take on wild terrains of rough patios. Fire Sense Commercial comes in more than one colors/finishes such as Bronze or Stainless Steel. Fire Sense Pro-Series is offered in Stainless-Steel. All these colors and finishes are available in the Amazon products section below. Note: For exact price information on these Fire Sense patio heaters, or to purchase, please refer to the Amazon products section below. So, which patio heater is better to buy? They are all equipped with either Piezo or Electronic ignition and tip-over protection. They are all weighted at their base for increased stability under windy conditions, and they all come with attached wheels for increased mobility. The Commercial patio heaters come in various colors and finishes so you can choose the right one that will integrate perfectly with your patio decor. Pro-Series heaters were constructed of high grade commercial quality stainless steel to ensure long durability with continuous operation. 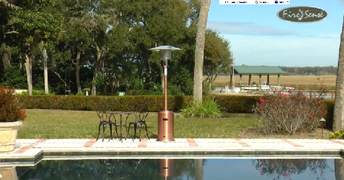 Their thicker heavy duty stainless steel construction will keep these patio heaters functional for a lifetime. ​That is why they come with the “Never Down" Lifetime Replacement Warranty, with defective parts covered for the life of the unit, so you'll always have a working patio heater. ​ Note also that they are heavier than the Commercial heaters, and therefore more stable under windy conditions. Please click the patio heater of your choice below for price information or to purchase. Note: Amazon often provides a good discount on the List Price of sold products. If a discount is available both the List Price and the actual Amazon Price will be shown when you click the images below. Please note: If you are also interested in a patio Fire Pit Table, please click the following article that compares two of the best and most popular Fire Pit Tables: Compare Popular Fire Pit Tables. Have you not found yet the heater you were looking for?